Christmas Day is four weeks today. I haven’t had a chance to think about my own Christmas preparations yet, but am starting to work on making the Tree House a bit more Christmassy. We now have a few books in the window, and a table with some Christmas gift ideas. I am also gathering together what we have in the way of Christmas-related books and music. Tomorrow I am in London (to see Bob Dylan – too exciting! ), but a friend is opening the shop for me, and is bringing a Christmas tree – also very, very exciting! The tree is my favourite thing about Christmas. We will also be opening late on Friday for the Christmas lights switch-on in Warwick Road, and I’m hoping to offer mulled apple juice (no alcohol licence – but this is very delicious!). Do call in and see if there is some Christmas reading to grab your attention, or some Christmas gifts for others among the books and CDs. You could also buy a Tree House gift voucher for someone, for any amount of your choice! A small assortment of Christmassy reads and a bit of music. 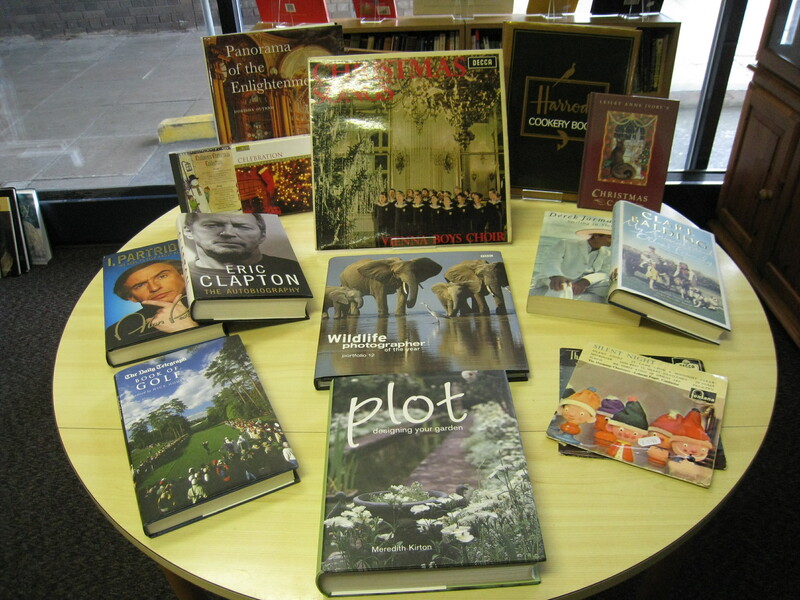 A few ideas for Christmas gifts – second-hand but in excellent condition. The Tree House Film Club relaunched! Before I secured the current premises for the Tree House, I attempted to set up a film club – a few of you came along, and it was lovely but in the end too poorly attended to justify the costs of hiring the venue. Now that we have our own venue, I have been longing to relaunch the film club – and now it’s happening! Thanks to some good friends, we now have screen, projector, speakers, DVDs and all we need to get started. The equipment and set-up will be refined in due course, but for now we have a good enough system to entice you to come and watch films on our comfy sofas (if you get there early enough!) and in the environment of the Tree House. To comply with the licence, we need to be a club, and anyone who comes will need to join the club in order to watch films – otherwise the licence is prohibitively expensive. The joining fee will be £5 a year, and films will then be £3 a time to members; money raised will both support the Tree House generally and go towards saving up to refine the screening environment! We are launching the club initially as a Sunday afternoon venture – tea, cake and an old-fashioned film. We would love you to bring along cake to share! 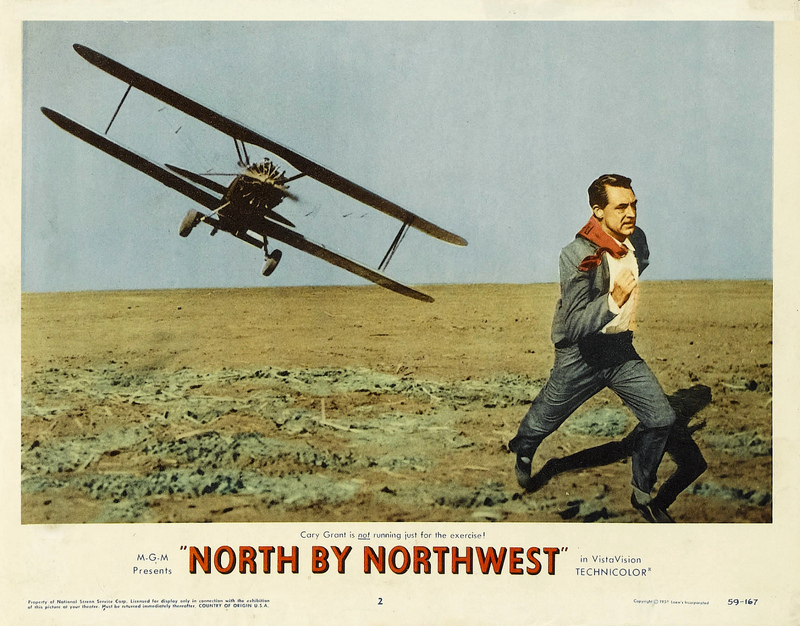 The first film will be the wonderful Hitchcock classic North by Northwest. Tea, cake and Cary Grant on a dark, cold Sunday afternoon – who could resist? I am very grateful for the support for this part of the venture being given by Coventry filmmakers Anti/Type Films and Paperbird Productions – good friends of the Tree House! Sunday 8th December, 3pm at the Tree House. £5 to join, includes the first film. Stop press – we now have speakers so we can show films, and we have a working boiler so the radiators are now making the Tree House toasty warm. Though I need to keep heating costs as low as possible, I can now make sure it’s comfortable enough to sit in the shop for a while – it really hasn’t been since the colder weather arrived! Today I am launching a scheme for anyone who would like to support the Tree House financially – you can now become a Friend of the Tree House. Subscriptions are £30 a year, and you will receive 10% discount on books, £1 or 10% discount (whichever is greater) on events, a £5 voucher to spend in the shop and free tea and coffee whenever you visit. See the About page for the details and a contact form, or email if you are interested. The Tree House needs your help! The other day I posted about how lovely it is to know that lots of people like the Tree House. I do want to focus on that – but the purpose of that post was really to highlight the fact that we need to increase revenue. I do believe the Tree House is on the brink of great things, but we just need a bit more financial help to get us through this period where we are on the verge of making a profit but not quite there, and therefore continuing to deplete our now meagre resources. So if you think the Tree House is a Good Thing, what can you do to help? At Nifty Needles, our weekly stitching group, last night people were asking this. I know that few can afford to give much money, but there are small things that can help. Donate £1 – either in the shop or by bank transfer. If everyone in the town gave £1 to help what many see as a community asset, we would be safe! Come to an event. There are various kinds of event on offer, including live music, art history talks, a weekly Tai Chi class, a speed dating event, and before long hopefully regular films. More besides! Spread the word – a lot of people are only just discovering we are here, which means a lot more have not yet discovered us. We should soon have a sign in place to cover the Job Centre sign which will help, and the Kenilworth Weekly News has done a great job of publishing things about us, but word of mouth remains the most effective form of publicity. Put up posters at work (I can email things to you) and in your kitchen, tell your friends and neighbours. Consider organising a fundraising event for the Tree House. Donate a Christmas decoration to hang in the window, or on the tree we will be having – this will also help to attract the attention of passers by! Donate a ream (or a wodge!) of printer paper so that we can print off lots of flyers. I have volunteers who will hand them out around the town. If you need a room for a one-off meeting or as a regular space, consider one of our upstairs rooms – prices available in the separate tab on this site. I am thinking of other ideas, but the key thing to remember is that every small donation helps. Thank you in advance! In the meantime I will continue doing what I’m doing – booksales are going very well, and interest in the venture is always growing, so I will keep developing ideas for how we can use the space and improve it. It’s all great, and hopefully we will keep getting stronger, but we’ve just reached a point where we need a bit of a boost to take us into the new year. Yes, watching films! I keep saying it, but the relaunch of the Tree House Film Club is getting closer. I should know more by the weekend – will keep you posted! If any rich person out there feels like investing in our wonderful corner of civilisation and would like to help in any way, or would like to sponsor our heating repairs, I’d love to hear from you! Always worth asking. I was 50 last weekend, and I’m getting cheekier in my old age. Stay warm. 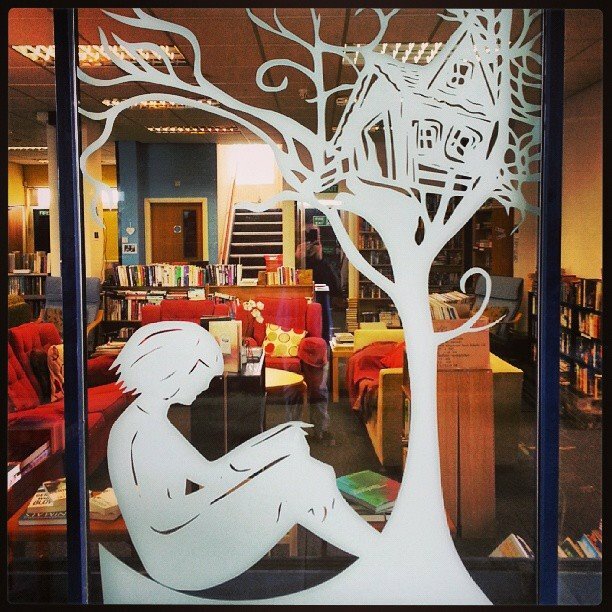 Come and buy a book to curl up with on the snowy evenings we keep being promised. Push the boat out and buy two, in case you get housebound! This Thursday, 21 November, there is to be a very exciting evening of live music at the Wild Boar in Warwick. 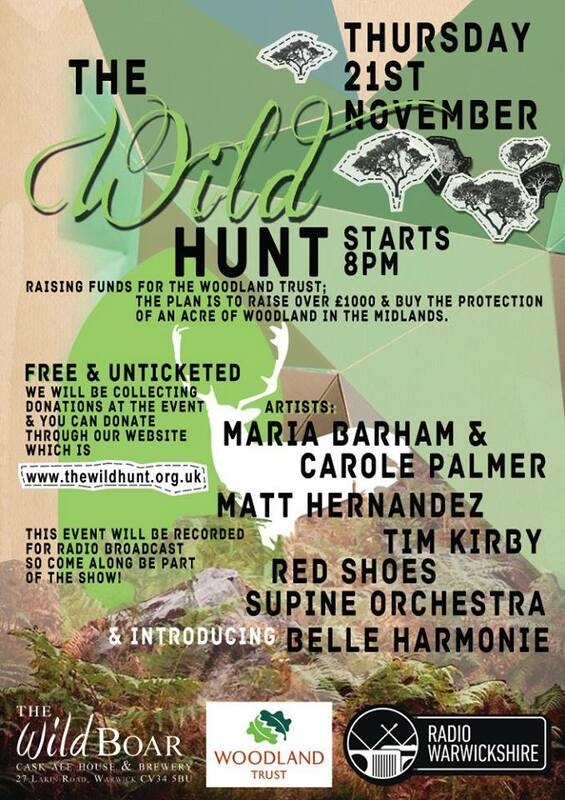 It’s been put together by a new organisation, the Wild Hunt, who decided to do some fundraising for the Woodland Trust; they received so many offers from folk musicians, both local and from further afield, that they have put together a live gig at the Wild Boar and produced a double CD of 32 tracks. They have decided to raise £1000 to buy the protection of an acre of woodland in the Midlands, in collaboration with the Woodland Trust. This is very exciting for the Tree House. You may remember an early post here in which I elaborated on my love of trees, which I find the most wonderful things on the planet, and the cause of saving woodland is very close to my heart. The name the Tree House grew out of my determination to get trees into the name for my own venture. So I have decided that when we do finally start making profits, we will support the Wild Hunt. I have so far said that profits will go to local charities, but I have decided to make the Wild Hunt the chief recipient of whatever profits we make, and the Tree House will exist in part to support them and to help protect our woodland. I will organise other fundraising events from time to time to support other local charities, but the profits from the business will go to support this fabulous venture. I hope to host an event at the Tree House in the new year specifically to raise awareness and funds for the Wild Hunt – an evening of storytelling and poetry, I hope, even some unaccompanied singing perhaps – all a bit sketchy at the moment, but should be a fabulous evening. I’ll keep you posted! In the meantime, do consider supporting the Wild Hunt – come to the Wild Boar in Warwick on Thursday, or buy the CD, or simply donate via their website. We need to preserve our woodland!